Imagine a world without America. No baseball. No New York style pizza. No fan boat rides in the Everglades, no mesquite smoked brisket, no listening to Sweet Home Alabama while you’re driving your GTO down Route 1 on your way to Vegas. This is literally the saddest thing we can imagine. Many countries have a national personification. England has John Bull. Portugal has Zé Povinho. Morocco took a creative liberty and made theirs an actual lion. But none stands prouder than Uncle Sam, who for over 200 years has called good Americans who love their country to action. Do you have what it takes to sport Uncle Sam’s signature locks and soul patch? Order our high-quality two piece silver wig and self-adhering chin piece and find out now! 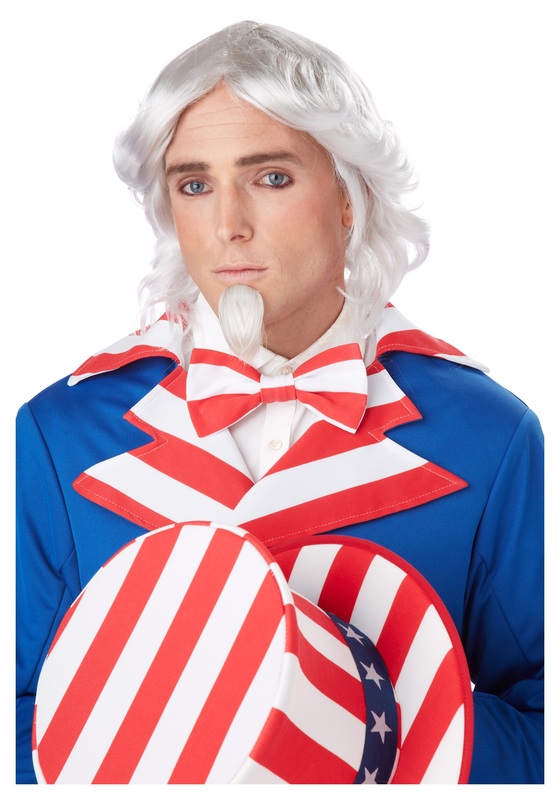 You'll be supporting freedom when you wear this wig and chin patch.